"It's bringing about the chemical transformation of raw food throught the application of heat." An old joke, but it went down well at the Royal Variety Performance show. The Queen laughed - Prince Albert found it funny too. But enough Christmas cracker gags. 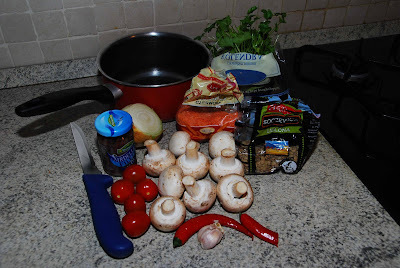 In the photo (top), are the ingredients for my Lenten Recipe 2, the hot'n'spicy lentil stew. The ingredients shown are enough for four portions. After the stew, dessert - Brazil nuts dipped in honey, washed down with freshly-squeezed orange juice. It's three weeks into Lent, and I've not touched alcohol, caffeine, meat, dairy products, fast food, salt snacks, confectionery, cakes, biscuits or salted my food. This being my 18th consecutive Lent, I realise that for well over half my adult life I've been abstemious at this time of year, and very healthy it is too. This year is less of a chore than last year's Lent, when fish was also off, along with TV (I watch rarely anyway), and popular music. This year, I'm allowing myself fish and jazz. As of now, I'm listening to Introducing Wayne Shorter (1959), recommended by Mr Nick Marsh of Kent. Sit-ups - steady at two times 50. The last ones are still killers; I won't push it - the important thing is to keep at it. Not to miss a morning or night. And it works; my waistline is now down to 38 and three-quarter inches (one and half inches less than before Lent began) - good going. Press-ups steady at two times 15.